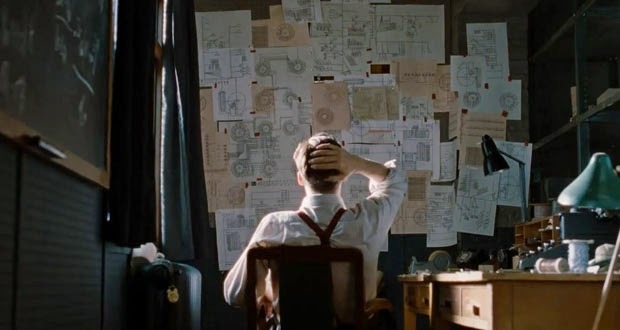 The thing is, I'm of two very different minds when it comes to analyzing The Imitation Game. On the one hand, I saw this movie with my father during the Christmas break, and we both loved it. It's compelling, beautifully shot, well acted, well written, competently directed, gorgeous music, solid story, the works. It's a very well made movie about a reasonably interesting topic, and there's no real reason not to like it. On the other hand, however, this movie bothers me because as a film person and as a woman who has spent literally all of her adult life analyzing media and cultural output, I can so clearly see the places where this film was manipulated into being catnip for the Oscars. Awards bait movies, we call them. The kind of film that Academy voters salivate over and just want to give all the awards for being "breathtaking" and "daring" and "unforgettable." And it's hard to reconcile those two parts of myself. The gleeful, happy bit that's just glad that I got to see a really good movie, and the more cynical annoyed part that would like to point out to everyone precisely how this film has maneuvered itself to be the next big thing. How do I balance all of that? Do these things really matter equally? And what should I think of the film as a whole? So for those of you who (unlike me) haven't been marinating in the film industry since high school, here's the problem: The Imitation Game is a lovely little film that follows the life and eventual death of one of science's unsung heroes, Alan Turing. Alan Turing is the one who essentially invented computing as we know it today, with a lot of help from the work of Ada Lovelace and others, and is generally considered the father of computer technology. His arguably greatest work was in creating a massive computer during WWII that could calculate through all the possible settings for an enigma code machine and break the German's code, allowing the Allies to read German communications and eventually win the war. The reason he's an unsung hero is because after the war, Alan Turing and his fellow codebreakers (some of whom appear in the film) were bound by the official secrets act to never admit that they broke the enigma code, and Turing himself was found legally guilty of "indecency" (criminalized homosexuality) in the 1950s. He was subjected to chemical castration and later killed himself. The codebreaking program was only made public knowledge in 1995, and Turing wasn't legally pardoned by the British government until 2013. So although lots of people have known about what Turing did during the war roughly for half a century, it's not until recently that we've had details or been really able to talk about it. 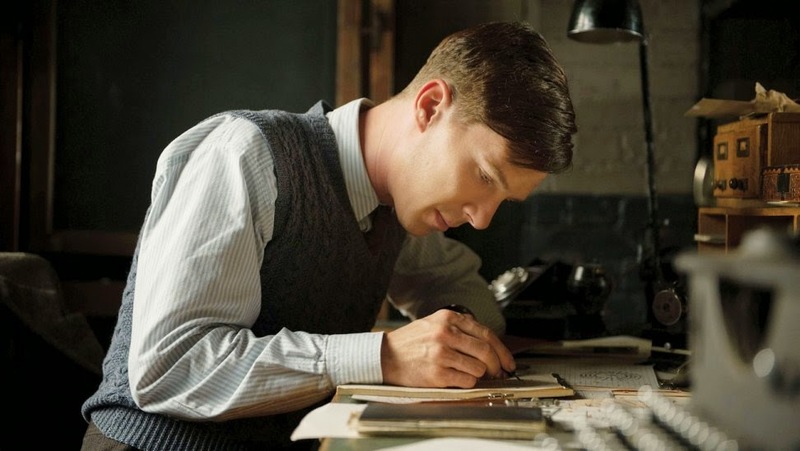 The film, written by Andrew Hodges and Graham Moore and directed by Morten Tyldum, takes a narrow view of Turing's life, and focuses its sights on his work during the war, with occasional leaps in time to his childhood at school and later to the criminal investigation that ruined him. Turing is played, as I'm sure you've learned, by Benedict Cumberbatch, who does a very good job at convincing us of his genius, but certainly plays up Turing's purported neurodivergence* and social ineptitude. Matthew Goode, Allen Leech, Matthew Beard, and James Northcote all do excellent jobs as Turing's fellow codebreakers, men who resent his genius at first but slowly come to love and respect him. Charles Dance and Mark Strong do admirable but perhaps expected turns as a gruff, antagonistic military commander in charge of the codebreaking program and an MI-6 operative respectively. 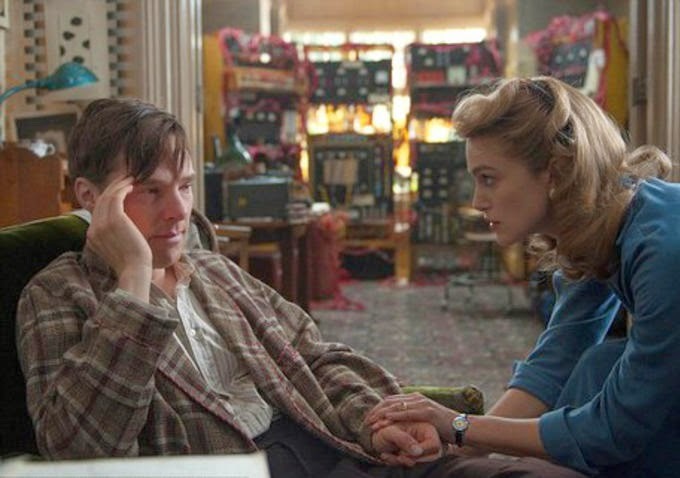 And of course there's Keira Knightley's character, Joan Clarke, an entirely fictional creation of the sort of women who actually really did exist but aren't recognized for their work - female codebreakers who were not allowed to work with the men in an official capacity but contributed greatly to the breaking of the code. Joan's presented as an amazing codebreaker, but because of "decency", the wishes of her parents, and the sexism of the time, Joan is forced to work as a glorified secretary at Bletchley, only helping Turing with his work late at night. It gets more interesting when Joan's parents tire of her work on her career and insist she come home and get married, so Turing proposes to her instead, but ultimately this becomes the downfall of the whole film. It turns the story into one of a woman desperately in love with an enigmatic genius who will never love her back, and leads to some very clunky storytelling at the end as the film then tries to backtrack and explain why Alan Turing did not, in fact, marry this nice young woman who was perfectly okay with him being gay and just enjoyed being with him, a fate that would have saved him from the obscenity charge. It's not well done, and it's clearly an overreach on the part of the writers. The bulk of the story follows what I outlined above, concentrating on Turing's arrival at Bletchley Park, his slow takeover of the codebreaking program, and the building of his first computer. The main action is about that computer, with everyone except Joan believing that Turing will never do it and it will never work. The climax of the film is when they figure out how to program the computer to break the code, but quickly realize that for security's reasons, they cannot actually reveal that they have broken the code. Instead, they have to only leak certain parts of the broken code to the military so that the German military will never realize they have broken the code and stop using it. Which is a common problem in cryptography but neither here nor there. So that's the basic premise of the film. And I hope you can see how it's a compelling and lovely narrative that finally gives good credit to one Britain's most brilliant men while also recognizing the brutality of the law that prevented him from living his life to its full potential. It's a good movie. But it's also a manipulative one, and I hope you can see that as well. See, the basic framework of this film is really nothing new to the average Academy voter or the audience. It's a movie about a super smart white guy who isn't good with people. No one believes in him at first but when he proves how brilliant and out of the box he is, with the help of a smart but not more smart woman who loves him unconditionally, he overcomes his obstacles and is super smart at everyone. Then something bad happens and he dies tragically, but with the knowledge that he was the smartest ever. A Beautiful Mind. The Theory of Everything. October Sky. Pollock. My Left Foot. I can keep going. It's clearly a thing. A very common, kind of annoying thing. Because, as you might notice, all of those films are ones that the Academy of Motion Pictures Arts and Sciences (the people who do the Oscars) doted on. They're super popular and considered "high cinema". As if the best thing a film can aspire to be is a movie about a historical white guy with some kind of disadvantage proving that he's actually as smart as he thinks he is. Taken on their own, for the record, these are all good movies. Each individually is the kind of film that I actually really like. But taken as a group, which they are, they paint a very frustrating picture of the film industry. It's not that I think The Imitation Game is a bad movie. I don't, because it isn't. But I do feel like the narrative was tweaked here and there to make it fit more neatly into this framework. It doesn't actually make sense for Turing to have a female love interest to support and guide him, since he was gay, but the film shoves one in there anyway. It's like no one knows how to make this movie any other way, without conforming to all the stereotypes of how films about geniuses are supposed to work. Geniuses are supposed to be a bit hard to get along with. Didn't we learn that from Dr. House? Alan Turing was actually, according to his colleagues, pretty well liked and friendly. But that doesn't work for the narrative of the film, so they made him a social outcast. The film shifted and finagled and sometimes lied in order to make itself fit the mold. And clearly it paid off, because the movie's been nominated for eight Academy Awards. Was it worth it? Perhaps the best distillation of this whole issue is the end of the film, where an older Joan goes to visit Turing during his recovery after the indecency trial, when he's been chemically castrated and can barely function. Because while that is a recorded part of Turing's life, and definitely one that should be included in the film, the movie actually does a pretty bad job dealing with it. It shows Turing, now shaky and sick looking, still working and being a genius and stuff, but completely glosses over the real problems he faced. He was sick, yes, and he also gained about a hundred pounds from the drugs they had him on. But that wouldn't look good for an Oscar nominee. It's not flattering. And so it wasn't included. Stuff like that, it bothers me. And on another issue entirely, while I resent Joan's place in the narrative structure of this film, because I hate the idea of shoving a love interest in there willy nilly, I loved her character and I would like to see an entire film just about her. 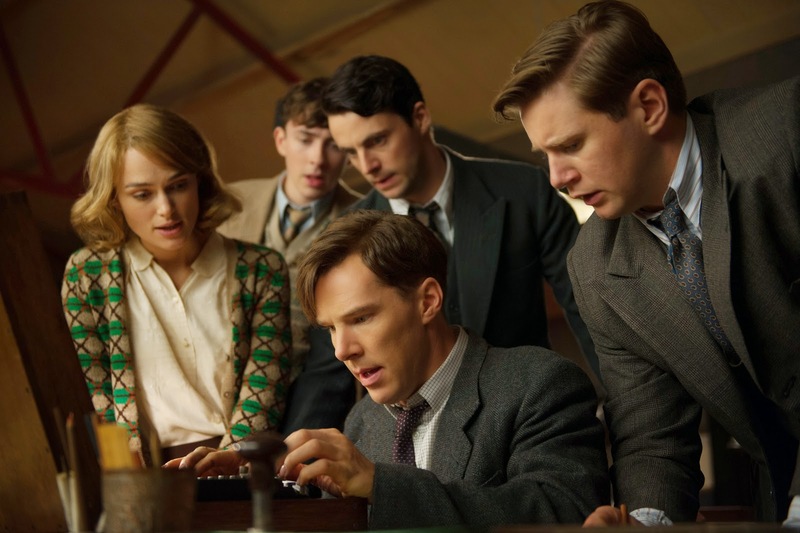 A movie about the women who were legally barred from doing the work the men did in codebreaking but did it anyway. Give me a film just about Joan and her sisters in arms, and I would watch it in a heartbeat. But make her second fiddle in a movie where she isn't allowed to be smarter than the male protagonist, and it bothers me a lot. I suppose when we come down to it, none of this frustration really takes away from the fact that I did enjoy the film. But, on the other hand, my enjoyment of it doesn't make the film any less cynical and manipulative. It's both. I don't really know how to reconcile myself to that, but I don't think I have much of a choice. Seriously though. An awards bait movie about sexism in the war effort in WWII. Someone get on that. *Alan Turing is one of those historical figures that people like to claim was autistic or on the autistic spectrum, and he well might have been, but we really have no way of knowing. I loved The Imitation game, the main reason for that was how well they portrayed Turing as being on the spectrum. My main reason for loving that is after growing up being known as Sheldon having a decent portrayal is like growing up eating only dry oats then being given a bowl of really nice porridge. but anyway bad metaphors aside IF thats how the writers chose to present Turing I'm 1000% ok with that. on another note yes women fighting sexism at Bletchley would be fantastic however mainly i want the WRENS (those women who operated the Bombe machines) to have a movie. kinda like a buddy movie with a group of WRENs yeah it's not awards bait but hey!!! I am jealous of you for getting to go to Bletchley Park! That's awesome! And if you like this topic, I highly recommend the movie Enigma. Very similar topic, and it has Kate Winslet being kickass and brainy as hell. I would absolutely love a movie about the WRENs. Also one about the Russian female-only bombers. Night Witches or something like that. They were awesome and I would love movies about them too. We need more historical lady movies that aren't about marriages! well I mean it wasn't shoehorned in because Joan Clarke was a real person who really was engaged to Turing and really did know he was gay and then later Turing really did break off his engagement with her pretty randomly and (she says) without telling her a real reason why besides the fact that he couldn't do it. That being said totally understand your mixed feelings about the movie. I was able to love it more whole heartedly because it's a popular mainstream movie about a REAL gay guy in history who so few people actually know (much less that he was gay) where his sexuality wasn't his only character trait NOR was it glossed over! As a LGBT member that was actually more than I was expecting. I totally thought they would downplay it until the end, when he dies, but it's an important part of his character while never being the MOST important. It made me happy. Also made me WEEP but whatever. Also I think I might have posted this twice (my internet is being sketchy) so sorry if I'm bombarding you with comments! I guess my problem with the whole storyline is that it *felt* shoehorned in. So it's mostly a complaint that the writing, for whatever reason, didn't seem to do a good job integrating this storyline in with the others, however true it turned out to be. And yes, I do think the film did a great job in portraying Turing as a whole and complete person whose homosexuality affected his life but was not the sum and completion of his life, rather than a caricature in either direction.